2:198 (Y. Ali) It is no crime in you if ye seek of the bounty of your Lord (during pilgrimage). Then when ye pour down from (Mount) arafat, celebrate the praises of Allah at the Sacred Monument, and celebrate His praises as He has directed you, even though, before this, ye went astray. Jabir reported that the Prophet (peace and blessings be upon him) said, “The ten days of the month of Dhul-Hijjah are the best days in the sight of Allah.” A man asked, “Are these days better than an equivalent number of days that are spent fighting for the cause of Allah?” The Prophet (peace and blessings be upon him) answered, “They are better than an equivalent number of days spent fighting in the cause of Allah. And there is no day better in the sight of Allah than the Day of `Arafah. On this day Allah, the Almighty and the Exalted One, descends to the nearest heaven, and He is proud of His slaves on the earth and says to those in heaven, ‘Look at My servants. They have come from far and near, with hair disheveled and faces covered with dust, to seek My mercy, even though they have not seen My chastisement. 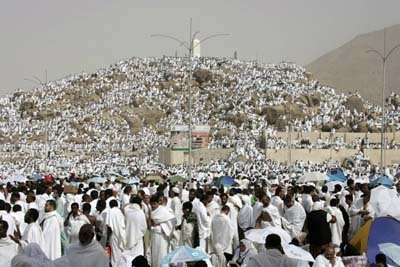 Far more people are freed from the Hellfire on the Day of `Arafah than on any other day. ’” Al-Mundhri said that this hadith was reported by Abu Ya`la, Al-Bazzar, Ibn Khuzaymah, and Ibn Hibban, in whose wording it is given here. 2. Make a list of your duas and everyone that asked your duas before you get to arafat. 3. Ensure you are at Arafah between Zawwal and sunset. 7. Pray for Allah’s abundant forgiveness. 8. Shed tears if possible seeking Allah’s mercy and repentence. ‘None has the right to be worshipped except Allaah, alone, without partner. To Him belongs all praise and sovereignty and He is over all things omnipotent. 10. If you not in Arafat try and fast on that day.